The Clean City law abolishes billboards and imposes strict rules on the size and placement of storefront signs. Violators face large fines. To the undiscerning eye of a visitor, there is nothing too unusual about Florêncio de Abreu Street in downtown São Paulo. The buildings, many of them noble structures with brightly painted façades and stone balconies, reflect the city's rich history, and the constant noise of commercial bustle and angry traffic are the clas- sic sounds of a major modern metropolis. But until last year, much of that eye-catching architecture went unseen. São Paulo is a supremely intense city whose futuristic mix of skyscrapers, helicopters, advertising and rain has earned it comparisons with the urban imagery of the sci-fi film Blade Runner. But for the longest time, the nice bits, like the buildings along Florêncio de Abreu Street, were hidden behind billboards, electronic ads, shop signs and street banners. Visual pollution, much of it in the form of advertising, is an issue in all the world's large cities. But what is pollution to some is a vibrant part of a city's fabric to others. New York City without Times Square's huge digital billboards or Tokyo without the Ginza's commercial panorama is unthinkable. Piccadilly Circus would be just a London roundabout without its signage. Still, other cities, like Moscow, have reached their limit and have begun to crack down on over-the-top outdoor advertising. Big, edgy and complicated, São Paulo has always been the ugly sister to the delicate, tanned and seductive Rio de Janeiro. But the success of the Clean City law has given South America's largest city (pop. 11 million) a new sense of confidence. The law not only made São Paulo a more pleasant place to live but also showed that relatively straightforward acts, when well planned and rigidly enforced, can transform the environment. "The great thing about the Clean City law is that it didn't involve much more than political will," says Regina Monteiro, the city's director of environment and urban landscaping and the woman charged with enforcement. "If you have political will and a little investment, then you can make a big difference." The law focused on two main targets: publicity and commerce. 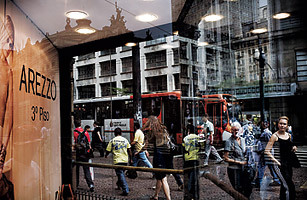 As the industrial and business capital of Brazil, São Paulo is a major retail hub and home to some of the world's most creative ad agencies. Those agencies had eagerly bought up every available space to hawk their products, hanging huge banners on the sides of apartment buildings and erecting billboards along main streets and ring roads. Everywhere you looked, there was an ad  for underwear, for cellular phones, for cold meats, for cars. The panorama was colorful but chaotic. Under the Clean City law, those signs had to go. Advertisers estimate that they removed 15,000 billboards and that more than 1,600 signs and 1,300 towering metal panels were dismantled by authorities. Commerce was similarly affected, since businesses with storefronts longer than 100 m were obliged to take down any offending sign and replace it with two smaller ones covering an area no greater than 10 sq m. Smaller shop fronts are permitted one sign no bigger than 4 sq m. All signs must be above the entrance and cannot extend into the street. Those contravening the laws are first warned, and if they do not take action, they face a minimum fine of about $5,000 and then possible closure. Although many Brazilian laws are applied only halfheartedly, Kassab, an assistant mayor who took power after his boss resigned to run for higher office, staked his credibility on the law and made a point of enforcing it. The upshot is that the once hidden city is visible again. Nowhere is that more evident than along Florêncio de Abreu Street. Since about 1900, this narrow road has been one of the main routes into the city center, and coffee merchants and other rich businessmen built homes and shops there in the Art Nouveau or Art Deco style of the time. Today it seems every second building has been refurbished or spruced up, and the façades with dates etched into the stonework, the narrow verandas with their greenery and the unmistakable Art Deco porticoes and windows are visible again. Intricate stonework, engraved and stained-glass windows and wrought-iron balconies that were destroyed or became dilapidated through years of neglect are newly resplendent. "This building is 100 years old, and we did it up so it was as it was meant to be," Adeilson Souza, the owner of a store selling gardening equipment, says of the restored Art Nouveau fronting. "You can see the details that were once covered by signs and wires and all sorts of mess. We even left the color the same as the original. This street used to be so ugly, but it is much, much nicer now. There's no comparison with before." Many of Souza's fellow citizens still have work to do. A large number of the oversize signs  as well as the huge ads draped over buildings  were there not only to attract customers but also to hide pipes, ducts, haphazard wiring, broken windows and grubby air-conditioning units. In a bid to stimulate renewal, the city offers exemptions from property taxes to offset the cost of renovations. Souza, for example, said he got back the $300 he spent on fixing up his place. That decision helped dampen criticisms from small-business owners who complained they had spent money on signs and could not afford to produce new ones, let alone carry out expensive renovations. Perhaps most surprising, the measure has won  albeit belatedly  support among advertisers, the sector hit hardest by the changes. Brazilian advertisers spent more than $100 million on outdoor ads in 2006, and they fought bitterly to block the law. When the challenge failed, they set their minds to finding alternatives and quickly came up with creative new ways to get their messages across. Some of the available ad money went to the city's free newspapers. The largest portion, however, was invested in the digital out-of-home industry that puts televised and electronic ads in commercial locations and public transport. Almost overnight, investment in digital advertising soared. It is expected to exceed $40 million in 2008, says Angelo de Sá Jr., vice president of Indoormidia, one of the sector's leading firms. "The impact of the Clean City law was huge because you had few alternatives in the city other than outdoors," de Sá says. "But from crises come opportunities, and out-of-home advertising is now in bars, in airports, on the metro, on buses, and that has all happened in just 16 months. One industry died and another one was born." Advertisers are still hoping legislation will be relaxed, and they have some grounds for optimism. The city plans to launch a tender for advertising on the digital clocks that dot many Brazilian cities and is also keen to offer temporary space on buildings to companies that pay for them to be restored.